On a crisp Wednesday on the 14 July 1920 amongst the poplars, at the foot of the Snowies, the people of Tumut, along with folk from Gilmore and Adelong and footballers from Gundagai, headed for the racecourse, in sulkies, on horseback, by bike, and by shanks’s pony. A few well-heeled citizens went out in their motor cars. Some would have come in to Tumut on the train. The talk of the town was the O.Beegling vs J. Lawson scratch footrace of 120 yards, scheduled for 2pm. Connections had placed £10 on each athlete. The winner was going home with 20 quid, at least four weeks wages for the average punter. Jack Lawson from Adelong was a thoroughbred. His father and uncle had both been competitive sprinters of some renown. Otto Carl Beegling the butcher’s son, better known as Boydie, may not have had the genes of a champion, but his job pushing dad’s meat cart around the gravel roads of the town certainly had benefits. As a teenager during the war, Boydie had risen to lieutenant in the local militia. The Beeglings had lived in the area since 1860, originally at Adelong. Father may have been of German heritage but Boydie mum’s was not and they attended All Saints Church of England. This confident young man was frequently called upon to master the ceremonies of Tumut. He started favourite. By 2pm a big crowd had assembled. In fact the biggest crowd ever seen at the Tumut racecourse for anything other than the racing of horses. To the surprise of the Tumut throng the Adelong boy won easily – covering those 120 yards three yards quicker in a classy thirteen and one quarter seconds. Doubtless many side bets were then settled. Tumut required a rematch. A new Tumut challenger was quickly found for flash Jack Lawson and a match scheduled for sometime in August. Next on the program was a rugby match between Adelong and Tumut Wanderers for the 2nd grade Lawson Cup. The drought of 1920 which has caused players to be ‘knocked about’ on rock-hard grounds had broken. Tumut won five to three. Otto Beegling atoned by scoring a try. And at 3:30 the Tumut Distict Union entertained the South Western Union team from Gundagai. The match was for a new 1st grade cup, donated by Mr E.J. Maher of the Wynyard Hotel, Wynyard Street, Tumut. The newest of the many cups available for football teams in the south west slopes, the Maher Cup was to be a challenge cup. All the match takings would go to the winner, the winner would host the games until defeated and all matches were to be played on Wednesdays. When Ted Maher stated that the teams would be “Union” teams he was not referring to the code, but that they would be a combination of men from various local sides. The selected Tumut combination team included only four members from the regular Tumut side – Tom O’Brien, Jack Elphick, Rube Masters and R. Bridle. 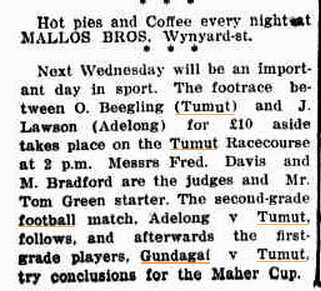 Tunut had been defeated 25-3 by Adelong two week prior. There were thus six selected from Adelong (E. Dunn, Con Crain, Jack Crompton, F. Roche, J. Roche and Roy Tonkin), as well as four from Tumut Plains (L & W Malone, V. Harris and Gerry Quirk), and R. Wilkinson who normally played for Gilmore. The The South-Western Union team, although based in Gundagai, was a composite side with men from Tumblong, Muttama, Coolac and Nangus. By the time the second match started fully 500 people had collected to witness Gundagai Union try conclusions with Tumut District Rugby Union for the Maher Challenge Cup. Play was fairly even for about 15 minutes of the first half, when the weight of the Tumut forwards began to tell, and R. Tonkin, heading a fine dribbling rush, crossed the line, and T. O’Brien added the extras. A few minutes later Tonkin, who was playing with great dash, again crossed the line, between the posts, and O’Brien from an easy position added the extra points. A little before half-time O’Brien, who was kicking splendidly, kicked two penalty goals from difficult angles. The tries for Gundagai were scored late in the second half by Smith and Davis. In the second half J. Crompton and T. O’Brien scored tries, and O’Brien converted one try and kicked a penalty goal, making the final scores, Tumut 27, Gundagai 5. Mr. J. Young was the referee. The local players then shouted the losers to dinner. To end the festivities two hundred and forty good citizens – one hundred and twenty couples – swanned across the boards at the Oddfellows Ball until late. The people of Tumut in the winter of 1920 had a very pleasant Wednesday in July. The Gundagai Times and Tumut, Adelong and Murrumbidgee District Advertiser, Friday 16 July 1920, p2. Available at http://nla.gov.au/nla.news-article123487145? Albury Banner and Wodonga Express, Friday 23 July 1920, p7. Available at http://nla.gov.au/nla.news-article102243054? Adelong and Tumut Express and Tumbarumba Post, 16 July 1920, p2. Available at http://nla.gov.au/nla.news-article112678365? This entry was posted in Matches and tagged Gundagai, Tumut. Bookmark the permalink.